Several years ago as the medical reporter for our local news station, I did a television segment on Equine Guided Education also known as horse therapy. 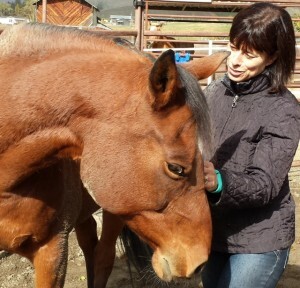 This is a type of therapy that uses horses to actually help people. Horses are very intuitive. They can pick up on our intent and do what we ask if we are very clear. That is where the therapy piece comes in. Many of us are not sure of our intent or how to implement it. In the session, I started by grooming the horse. Of course, being the type-A person that I am, I started brushing the horse very quickly and June, who holds a doctorate in education, pointed out the fact that I was rushing and suggested I slow down and experience what I was doing. Once I did that, it was almost like meditating. For about 15 minutes I relaxed and found myself completely in the moment. My next activity was to get into the training ring alone with the horse. With just my intent, I was supposed to get the horse to run around the circle. At first, I just stood there not knowing what to do. Then, I focused my intent and started running around the circle myself; talking and cajoling the horse to move. For one, very brief instant we were one. I completely communicated with the horse and she started to move. For that short moment in time, it was like an electrical charge between us, and then it was over. June wisely pointed out to me that although I was able to get the horse to move, I was the one doing all the work. She asked me if there were any similarities in my life. I had to admit that I have always overdone for others. I overdid for my children, for my patients and for my friends. This experience occurred over 10 years ago and her words are right there in my ear every time I find myself in that same situation. I have stopped going overboard for my children and that has been a very good thing. They are empowered and self-sufficient these days. They have problems, they ask for advice, and I am okay with whether they take it or not. I do not go crazy trying to convince them or stop them from making what I see as a potential mistake. For my patients, I have also improved. I no longer send them audio cards to put on their fridge that say (with my voice) “Step away from the refrigerator!” I have stopped calling them in the morning to remind them to exercise. It never worked and was way too time consuming for me. And, I was doing all the work. If they are going to be successful they need to find the strength within themselves. Where I still have trouble these days is with my friends. I am not sure why that is. I find myself trying way too hard. I feel like I am back in the ring with that horse again. I bend over backwards to help them medically and emotionally, and when I look back I find the return is fairly small. I rationalize what I do by convincing myself that I do not need anything in return. But, I am lying to myself. I do. I need at least a modicum of gratitude and to know that I am making a difference and not being used. I have a feeling that I am not alone. Those of us in helping professions have a tendency to bend over backwards for all of those in our lives. So, today I declare that I am no longer going to cajole, jump up and down, and do all the work. I am slowing down and stopping in that ring. I will clearly communicate my intent and watch what happens. I am going to try very hard to stay in the moment and remember what I learned from my Equine Guided Education/ horse therapy experience. It has taken over 10 years, but I think I am finally ready! Thank you June, for all your great lessons. If you ever have the opportunity to do something like this, I highly recommend it. One session has given me life lessons for now and many years to come. Horses and horse therapists are simply amazing. I am addicted to coffee and proud of it. I look forward to the ritual of that morning cup of coffee to start my day. I felt guilty for many years with the thought that maybe it was not such a healthy thing to be drinking. However, as more studies have been done, I feel pretty good about my morning java. In the early coffee drinking years there was a concern that it caused pancreatic cancer. That is because when the studies were done, they did not control for cigarette smoking and other risk factors for pancreatic cancer. It turns out that coffee drinking and cigarette smoking go together for many and that is how coffee got the bad rap. It was the cigarette smoke and not the coffee that increased the risk for pancreatic cancer. Now we know that there are actual benefits to coffee drinking. There are many. Here are a few. Read on. Coffee helps with alertness and the ability to focus. A study done at Pennsylvania State University found that 1 to 2 cups of coffee a day improve concentration and memory. A study done by the University of South Florida and the University of Miami found that in patients with mild cognitive impairment, those who drank three cups of caffeinated coffee regularly had a slower progression to Alzheimer’s disease by several years. Coffee may prevent dementia altogether. Several studies have found that those who drink caffeinated coffee have a decreased risk for developing Parkinson’s disease. In addition, a recent study found that those with Parkinson’s disease who were given caffeine (the equivalent of between 2 and 4 cups of coffee a day) had significantly improved movement. A research study of over 50,000 women found that drinking 4 or more cups of caffeinated coffee daily decreased the incidence of depression by 20% as compared to those who did not drink coffee. A smaller study done in Finland found that men who were frequent coffee drinkers were less likely to commit suicide. Research has found that women who drank the equivalent of three or more cups of caffeinated coffee daily had a 20% decrease in the risk of developing basal cell cancer. Men had a 9% decreased risk. Yet another study found that women who drank four or more cups of caffeinated coffee daily had a 25% decreased risk of developing endometrial cancer when compared to women who drank one cup or less daily. Yet another study found that those who drank four or more cups of caffeinated coffee daily had a 39% decrease in oral cavity cancers. Several studies have confirmed that those who drink four or more cups of coffee daily have a 50% decreased risk of developing type 2 diabetes. Another study has found that coffee in moderation (described as 2 cups a day) decreased the risk of heart failure by 11%. Of course coffee does have some risks. It can precipitate heartburn and gastroesophageal reflux. Some people may get jittery if they overindulge, and it can cause palpitations in others. Adding sugar, syrups and cream can turn coffee into a high calorie drink. The caffeine addiction is real for habitual coffee drinkers and withdrawl can cause a wicked headache. However, overall it is relatively safe. I am not urging anyone to start drinking coffee, but I would like to ease the guilt of those coffee drinkers who have been worrying about its safety. Drink your coffee but remember (which will be easier for you to do if you drink coffee!) as in all things, moderation is the key. May is Stroke Awareness Month. Do You Know What To Do If You Are Having A Stroke? If you think you are having a stroke call 911. Time is of the essence. It is possible in some cases to reverse the damage of a stroke if you are treated within hours of having symptoms. Find out more about stroke in our book, The Smart Woman’s Guide to Midlife and Beyond”. I read a wonderful article by David Brooks of the New York Times called “The Moral Bucket List”. He spoke about what is really important in our lives. I saw him interviewed about the topic. He pointed out that as a result of our desire to make our children feel special there is a growing rate of the population who feel they are very important. In 1950, twelve percent of high school seniors said they considered themselves very important. In 2005, the response was eighty percent. Social media compounds the problem. With Twitter, Facebook and YouTube, one can easily be the star of his or her own show and many have become just that. Along with this attitude comes a sense of entitlement. A great example of this is the recent rant by Britt Henry, an ESPN reporter who felt that since she was on television and “so important” that she could berate a towing company clerk. In medical practice we see similar behavior. There are many thoughtful, grateful patients out there don’t get me wrong. But, there are some who feel entitled to immediate attention when it is not warranted and who don’t seem to understand that many of us are treating huge numbers of people. David Brooks has inspired me to come up with a moral bucket list for patients. Be understanding. Improved access to health care has caused an overload to the medical system. The majority of doctors are trying very hard to fit everyone in. It may take some time for them to return non-urgent phone calls. Be patient. A little empathy goes a long way. Be humble. If you see your doctor outside the office and mention an ailment, do not expect him or her to remember the details of your conversation. If you would like a plan of action, call his or her office if you would like the problem evaluated. Be prepared. Know your medications and your dosages. It will save a lot of time. Do not expect your doctor to remember your list. Although there is a ist in the chart, it takes time to sift through the medical record and quite honestly, you should know what you are taking and how much. Be honest and direct. Come prepared for your visit. Most doctors can figure out what is wrong with you if you give them a good history. We are not mind readers. Be a steward of your own health and wellness. The majority of disease is due to poor lifestyle choices. You cannot expect your doctor to “fix” you. The only one who can help you is you. Your doctor can be your guide but you have to do the work. Finding what is truly important in life is essential. Learning to handle life’s challenges with grace and humility is a start. When it comes to health a similar approach is needed. Treat your body with respect and appreciation and extend that same behavior to those who care for you as well. If you can do that, the world will definitely be a better place for all of us.